Normally, trainers and strength and conditioning coaches tend to complain that fighters don’t train hard enough. 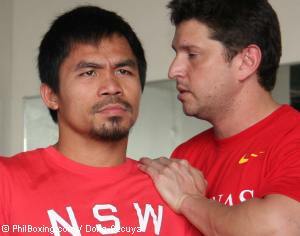 But in the case of pound-for-pound king Manny Pacquiao its just the opposite. Pacquiao sparred twelve rounds on Saturday, going six with welterweight Shawn Porter and three each with longtime sparring partners, lightweights Raymund Beltran (24-4, 16 KO's) and David Rodela (15-3-3, 6 KO's) who has a scheduled fight next week. The strength and conditioning guru who teamed up with celebrated trainer Freddie Roach some two weeks before Pacquiao scored a dominating 9th round stoppage to win the WBC lightweight title from David Diaz said Pacquiao has “too much pressure, too much power, his speed, his footwork. He looks very good. Pacquiao who sang the song in his TV appearance on the Jimmy Kimmel Show prior to his masterful conquest of the much bigger Antonio Margarito, Pacquiao used breaks during training to record the unforgettable, iconic ballad. Initial reviews say Pacquiao “delivers a passionate performance that shows the warmth and courage in the boxer’s heart.” The CD/DVD will be available on April 28 at iTunes and Amazon.com while a preview is available on mannysings.com. In a brief message to his millions of fans around the world Pacquiao said "you know I'm excited about the new album 'Sometimes When We Touch' with Dan Hill and I hope you are gonna like it."